Gaian Economics: How is the Chancellor Engineering a Pre-Election Boom? How is the Chancellor Engineering a Pre-Election Boom? After several years of dire economic news, suddenly, just about the time when parliament went into recess, the stories about the British economy changed. Almost overnight we moved from gloom to boom, with Osborne celebrating 0.6 growth and the euphoric tone of the journalists outstripping that of the Chancellor. With an election now just 18 months away, and it being certain to be an election dominated by arguments about the economy, this has made me rather suspicious about how this return to economic joy is being measured, and how the dark forces of monetary manipulation might be influencing it. I am not alone in my suspicion that the happy economic news may not be all that it seems. The traditional left, however, limits its critique to the suggestion that the increase in GDP is being driven by the retail sector and is based on withdrawn savings by those who can no longer wait for their wages to rise. Frances O'Grady's claim that 'Britain's fragile recovery is being propped up by families raiding their piggy-banks' is supported by ONS data showing that the ratio of household spending to savings has fallen from 7.4% for 4.2% in the past year. What first made me nervous about the 'return to growth' was Faisal Islam's excessive use of superlatives on his Channel 4 News report on Monday. He has Capital Economics predicting 1.5% growth in this quarter alone, with huge increases in both business confidence and business investment. This caused me to think back to the stories of companies sitting on cash (largely accumulated as a result of the government's loose monetary policy via QE) because of fear of investing it. There was much discussion of how the Chancellor might encourage companies to invest their cash-pile to revive the economy, including the suggestion that he might impose a levy on them for stagnant cash holdings. Has the Chancellor somehow found a way of encouraging UK corporates to start spending the £750bn. they have in reserves (incidentially, a figure equal to half the UK's annual GDP)? Certainly his proposal for tax relief on smaller companies, who apparently hold around £120bn. of the total, which was included in last year's autumn statement, may be beginning of have an impact. But is there some other incentives for companies to invest, or threat do them if they do not? The less subtle evidence of engineering is in the form of the incentives to restart the housing market, that well worn engine of unsustainable booms past. The Help to Buy scheme supports purchasers of new homes to take on mortgages that the banks think they cannot afford to pay. It is thus risky in two regards, since it will tend to keep house prices at the sort of excessive levels that led to the financial crisis in the first place, and at the individual level it risks households losing their homes if interest rates rise. It does appear to have stimulated a boom in house building which helps to explain the higher GDP figures. 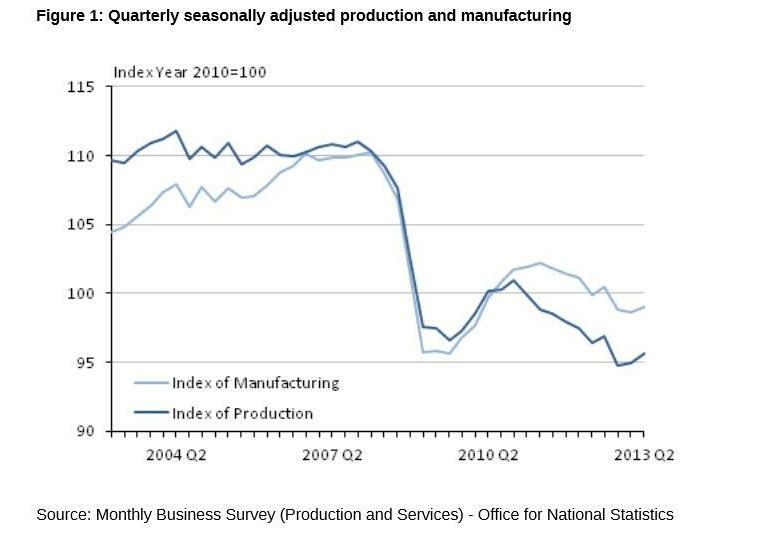 The manufacturing and production figures illustrated in the graphic make it clear that the hype over recovery is seriously overdone. 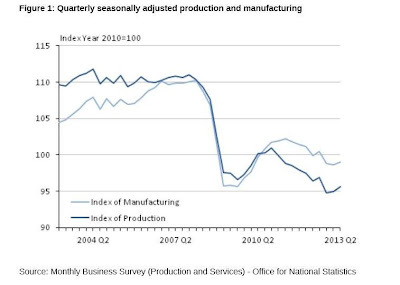 Production and manufacturing - the sort of real economic activity that the Conservatives claimed they wanted us to rebalance towards - is still struggling and nowhere close to the level it was before the financial crisis. The improvements we see appear to stem much more from monetary manipulation and the shuffling of cash between various elite players. This sort of wealth does not find its way down to those on average incomes who are struggling with the consequence of the capitalist disaster of 2008. However, the Conservatives are playing the politics of this extremely cleverly. The Chancellor is likely to come out of his term in shared government with the public sector smashed up and Labour vowing to continue with these destructive and draconion cuts. The recession has also led to a culture of fear amongst employees, who are accepting reduced wages and appalling working conditions, as exemplified by the zero-hours contract. A success for George and his cronies but the real problems around the failure of manufacturing, the ongoing trade deficit and lack of resilience in our local economies and the iniquitous failure of the banking system are all yet to be addressed.